ing of the carpet. beneath the pad onto the subfloor. cess using this system. stains. Allow the Urine Stain Remover to dwell for 10    free from odors. same level as the urine contamination,                   is present. and could possibly swell with the introduction of           source. 2. Press the solution into the carpet by                    metering tip removed. 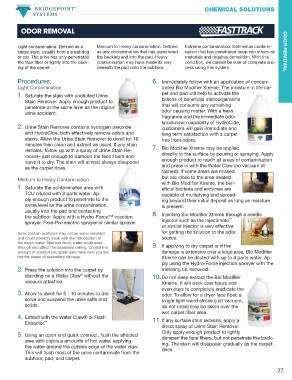 direct spray of Urine Stain Remover. the water around the outside edge of the water claw. dries.